SDC’s Artistic Director shares his advice for the upcoming company auditions. Since Rafael Bonachela’s controversial appointment as Artistic Director of Sydney Dance Company in 2009, the company has gone from strength to strength. Sydney Dance Company has presented stunning new works with some of Australia’s best dancers, including we unfold, 2 One Another, and 360°, and toured locally and overseas to rave reviews. A contract with SDC is such a coveted position. Can you give readers an idea of what you are looking for in a dancer? We are looking for outstanding dancers with demonstrated experience working with professional choreographers. They need to be creative, open-minded, highly intelligent, adaptable and also capable of following direction. Physically they need to be very fit with incredible stamina, strength and flexibility, and highly developed intrinsic core strength. They need to be confident with task work and improvisation as well as repertoire and be willing to question and challenge, and be challenged themselves. Why is it essential for only dancers with vocational training to submit an application? We find that these applicants are the best prepared for the way we work and can hit the ground running. In our experience dancers who have been in full-time training are best prepared for the level of intensity, exactitude and endurance that is required in our dancers. Given that dancers need to firstly submit an application for an audition, what suggestions do you have to help them have their applications stand out? Or are you simply looking for previous training/experience that ticks certain boxes? Read our requirements carefully and submit your application according to this – spend some time making sure your CV clearly demonstrates that you have the right combination of skills and experience. Don’t neglect your basic CV skills. Use an easy to read, clear font and be succinct – 2 pages is enough! Also make sure you are using a recent headshot and that it is embedded on the first page of your CV so we can clearly and easily identify you. It’s also a good idea, for future audition opportunities, for dancers to attend our intensive week so that we can see you and put a face to a name when an application comes in. And of course watching our performances when you can is very important to get a sense of the repertoire and company ethos. What advice do you have for dancers at the audition? We will be providing more details to dancers who are invited to audition but a few general rules always apply such as being here in plenty of time and wearing comfortable dance clothes (including some form fitting clothes so it is possible to observe your physicality as a dancer). Be mentally and physically prepared – you need a positive mind set and willingness to be creative and give 100% . What can dancers expect when they join SDC? The dancers can expect to work hard. The workload is high, however, the artistic rewards are there and we have some very exciting things lined up for the next couple of years. We do challenge our dancers and we expect them to always be fit for work. There is excellent support for their artistic development and care. There is a great energy and goodwill within the company and we expect dancers to contribute to this ethos. Sydney Dance Company is a full-time commitment. To give applicants an idea, in 2011 there were more than 70 performances across 14 cities and 5 countries. Usually there will be two major seasons in Sydney plus national and international touring. A standard rehearsal day in the studio is from 9.30am – 6.00pm, including class, rehearsal and breaks, but there are plenty of variations on this through the year. A standard performance day in the theatre is 12pm to the end of the performance. At Sydney Dance Company we strive to create world-class work that stimulates audiences and dancers alike. We work with both Australian and international collaborators – each one chosen for his or her capacity to contribute artistically to a whole. I want to work with the best dancers and showcase the incredible talent of the Company on stages around Australia and the world. All applicants must have a vocational qualification, professional experience in contemporary/classical dance and be 18 years or over. Applicants must hold either Australian or New Zealand citizenship or a valid visa to work as a dancer in Australia. To be considered you must be experienced in developing movement with a professional choreographer, display high levels of stamina and flexibility, possess strong improvisation skills and an understanding of Sydney Dance Company’s creative outputs. To apply: If you meet the criteria outlined above then please send a current CV, ONE headshot and ONE full body dance shot to audition@sydneydancecompany.com. Please ensure all attachments do not exceed 1MB and that each attachment is saved as your Full Name as the file name. Only emailed applications to the specified address will be considered. Deadline: Friday 13 July 2012. Late applications will not be accepted. Successful applicants will be invited to audition on August 4 & 5 2012 in Sydney at their own expense. 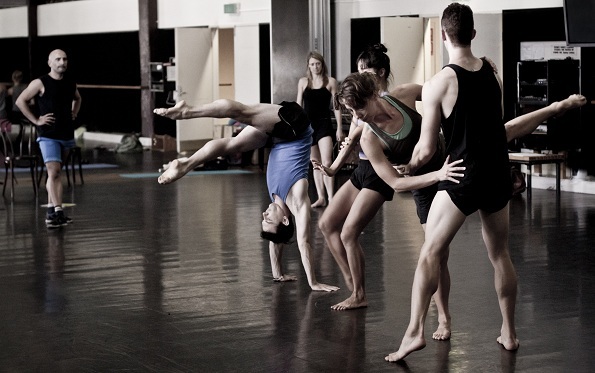 Top photo: Sydney Dance Company in rehearsal.